There are times, when they are feeding on dead and dying coarse-fish fry, when trout will take a floating imitation and no other. Various materials such as foam have been used to fashion effective floating fry but the original and still the best is deer hair. It is soft and buoyant but will also absorb a little water, with a gentle squeeze. This allows the fly to be fished barely floating, which is just how the real thing sits, with hardly any part showing above the surface. 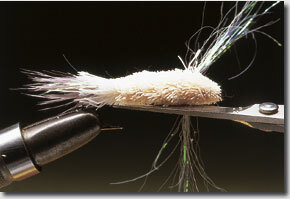 The result is a “fly” that will fool even big, grown-on trout, which is just as well, since creating floating fry from deer hair is rather time- consuming. However, if those big, back-end fish are the target, it is well worth the effort. Deer hair can be used to fashion most prey species but the two most common are perch and roach. Both have basically the same shape, so the main decision when beginning to tie is whether the pattern is to be tied upright or flat so that it floats on its side. The latter method has become the standard simply because it is the most natural position for a dead fish. 1. Fix the hook securely in the vice and run tight, close turns of thread down the shank to the bend. Catch in a pinch of grey or orange marabou plus a few strands of pearl Crystal Hair. 2. Take a bunch of white deer hair. Trim off the fine tips and position it so that it projects over the tail. Wind on two or three loose turns of thread to coincide exactly with the tail base. 3. Continue winding on further turns of thread and, at the same time, begin to pull them tight. This will cause the deer hair to flare. Ease the hair evenly around the hook. 4. Add further, very tight, turns of thread through the hair. These lock it securely in place. Stroke the hair back and bring the thread to the front of the bunch. Add more turns of thread. 5. Take a second bunch of deer hair, the same size as the first. 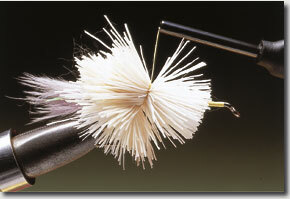 Trim away the fine tips to leave just the thick, buoyant section and position it with loose turns of thread. 6. Pull the thread tight so the hair spins evenly around the hook. Secure with thread then add a third or fourth bunch until three quarters of the hook is covered. Catch in a long bunch of pearl crystal hair. 7. 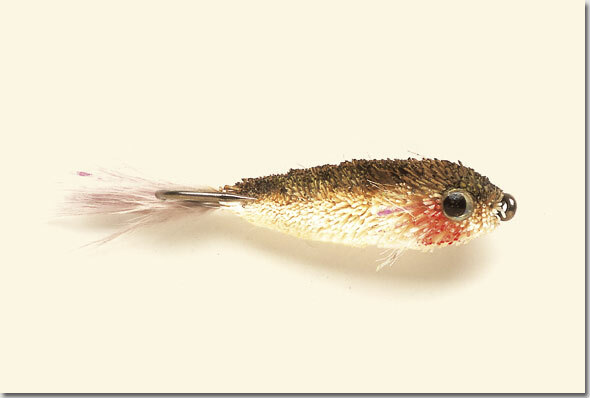 Position the Crystal Hair so that the ends are above and below the hook to eventually suggest pectoral fins. Add a final, large, bunch of deer hair to fill the gap left up to the hook eye. 8. 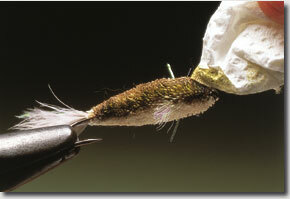 Push the hair back from the hook eye and cast off the thread with a whip finish. Trim the hair to shape using small snips until enough hair has been removed to allow more drastic cutting. 9. Keep trimming carefully, especially around fins and tail. As this pattern is intended to float side-on, more hair should be removed top and bottom than at the sides. 10. Once the required fish-shape has been produced, trim the strands of Crystal Hair short and remove any ends of deer hair projecting over the marabou tail. 11. Using waterproof marker pens add colour to the top and upper sides of the fry’s body. Leave the lower sides and belly white. 12. Add a mixture of brown, olive and grey to create a similar colour to a small roach. Blend the colours with a piece of kitchen paper to create a smooth effect. 13. With the colour applied to create a subtle effect, work a small amount of clear epoxy into the deer hair. This will hold the decal eyes securely in place. 14. Carefully push the eye on to the patch of epoxy and allow to dry. On patterns designed to float on their side, only one eye need be used. 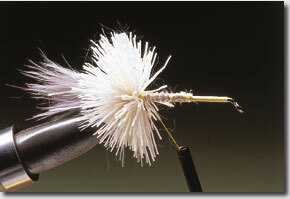 The Floating Fry is a deadly pattern on any lake where trout feed close to the surface on coarse-fish fry. Late summer and autumn are the times when trout most regularly feed on coarse-fish fry and, logically, it is then that an imitation such as the Floating Fry is most successful. Invariably a floating line is used with this pattern. 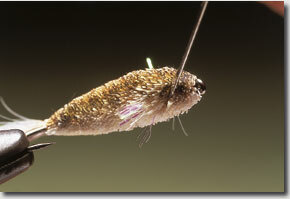 As the Floating Fry is both large and air-resistant, a weight-forward line rated 8-9 is required to cast this fly. 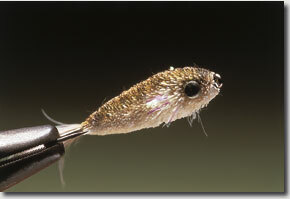 A strong leader of at least 8 lb breaking strain is also needed to prevent breaking the fly off while casting. When creating the body of the Floating Fry do not pack the deer hair overly tight. 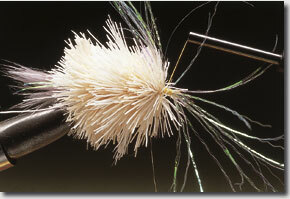 Aim to create a soft body which will float but will still absorb a little water when being fished.